I had few pictures with Sony NEX 5N and a good old friend of mine with Spiratone Plura-Coat 20mm f/2.8 in K-mount. I sold this lens when I got a used DA 21mm limited -- and it is my attempt to control lens count. But later with addition of Pentax DA 15mm f/4.0 limited, I parted with DA 21mm limited. It was my wrong move in parting the 21 limited as it serves as a good pair for 15+21. The 15mm is great for the wide landscape and 21mm is excellent for the wide normal and street shooting. And in saving money, I did not re-purchase 21. Instead, I got back to my inexpensive 20mm friend with Spiratone. I dislike the use of green button in Pentax digital and this 20mm lens is actually more user friendly in the Sony NEX. Thanks to the great MF features in NEX -- any K-mount lens is UP a notch or two in terms of ease of use in focusing, metering and use of flash. Performance is quite good considering 1/5th the cost of a new DA 21 limited. This 20mm is a rare item but certainly not a well sought lens. 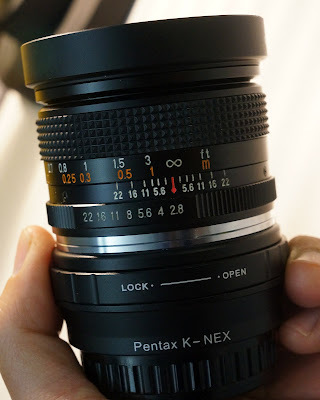 The lens is not a huge lens and quite small comparing to other 28mm. The only gripe that I have is on short focus throw -- about a quarter turn and I wish it a touch longer as closer to 1/2 turn. When mounted on the NEX, it becomes a bit bulkier like other K-mount lenses but I find the added bulk of the adapter sometime help with the focusing as there is more space to work with and it is easier for me to fine tune focus with my palm supporting the base of the adapter + lens. Marvelous!!! Job you have done. Actually, you are pleasure to know, seriously. Your work is incomparable. It’s a masterpiece. Your article is very resourceful and beneficial. And the work done is appreciable. ani idea hiw much does the aperture control unit cost? and where to get it?